All figures begin their lives with a few simple photos or drawings and it is up to the sculptor to come up with a three-dimensional representation of this character. Techniques for figure sculpting vary with each individual artist, but for the most part the steps are fairly standard. Sometimes a small metal armature is made for the torso area that will act as a skeleton and allow for accurate placement of the head and limbs. Clay is added over this small framework and the process basically begins from here. I should note here that some artists do not use this skeleton and their beginning point is plain clay. The amount of detail created in the clay sculpture depends on the artist. Some artists take their clay sculptures far along with a lot of detail, while others only sculpt the general shape and major features of the character and leave the detail work to the next step. When a satisfactory point is reached, a mold is made of the clay sculpture. If the metal framework was used, it is removed from the clay for placement in what will soon become the actual "original" sculpting. A wax casting is made from this mold and the sculpting will be modified and detailed in wax from this point forward. With the exception of 8D8 and EV-9D9, every Star Wars figure was sculpted at a 1:1 ratio - or at least that's the concensus thus far. These two figures were sculpted at a 2:1 ratio (twice the size) because of the intricate detail involved in creating them. These are called "2-ups". The figures for the Micro Collection were sculpted at a 4:1 ratio (4 times the size they would be produced at) and are appropriately called "4-ups". Each part is detailed separately and additional wax is added if necessary until the shape achieves it's final form. Small plastic cones are imbedded in the arm and leg sockets so a smooth and strong contact area can be constructed. Small metal pins are pressed into these cones and attach to the torso via holes in the shoulders and hips. At this stage, the figure is articulated and each pinned joint allows the sculpting to be completely disassembled. The metal skeleton provides a stout surface for the head to be attached and sometimes the pins for the limbs are a part of this framework. Other wax originals have the plastic cones in the torso such as the ones in the limbs. The cones are imbedded in the wax and will touch base-to-base when the figure is assembled. These cones are quite necessary because without them, the wax would crumble around the metal pin resulting in a sloppy joint. 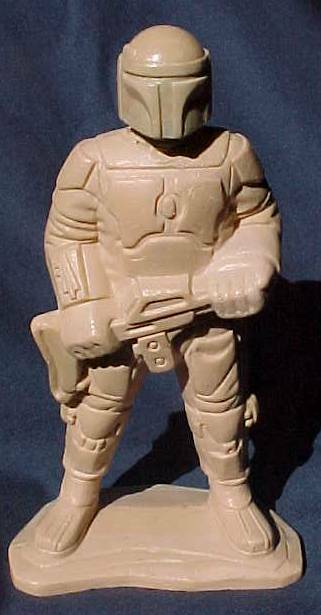 As stated earlier the process depends on the artist and in fact, one artist at Kenner did his work in acetate instead of wax and used milling machines to make his creations come to life. An incredible feat indeed which also resulted in a tough original sculpting quite unlike the fragile wax ones. These were completely acetate and did not require the plastic inserts. The acetate sculptings I have seen were all flesh-tone in color while the waxes were usually white, tan or flesh-toned. The conic, plastic inserts were various colors like white, clear, and blue. Remember that many different artists with many different techniques used the materials at hand to create these works of art. At this point, however, the original sculpting is completed.